← DAMIEN CAVE. Blurred lines between journalists and what we cover. BEH LIH YI. Malaysia’s new deputy PM aims to be a role model for women. 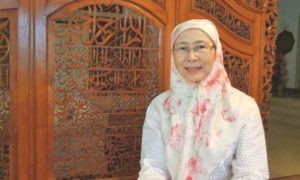 PUTRAJAYA: Wan Azizah Wan Ismail’s childhood ambition was to become a doctor and cure disease. Now that she is Malaysia’s most powerful female politician, she says her mission is to improve women’s rights. The 65-year-old made history this month when she was named Malaysia’s deputy prime minister. She is the first woman to hold the post, and one of only a handful of female politicians in high public office in Southeast Asia. Wan Azizah has vowed to push for greater women’s rights in a country where female representation in national legislatures is among the world’s lowest. “People look up and say, ‘Yes, we have hopes’,” Wan Azizah told the Thomson Reuters Foundation on Monday, in her first interview since being sworn into office. “Women now see that you can break barriers, it can happen — with a little bit of perseverance, commitment and belief that you can actually do it,” she said at her office in the administrative capital, Putrajaya. Wan Azizah has also been tasked to head the Ministry of Women and Family Development. Although it is Southeast Asia’s third-largest economy and women generally lead a modern life, Malaysia was ranked 104 out of 144 countries in the World Economic Forum’s 2017 Gender Gap Index after scoring poorly on political empowerment. Trained as an eye surgeon, Wan Azizah was first thrust into politics after her husband, Anwar Ibrahim, was sacked as a deputy premier and jailed in 1998. She went on to lead an opposition front and mobilised support for his release. Campaigning on a platform of reform, Wan Azizah and the opposition alliance swept into power in the historic May 9 poll, heralding the first change of government since Malaysia gained independence from Britain in 1957. The soft-spoken politician said her priorities would include strengthening legislation to protect women from sexual harassment and abuse, especially in the wake of the global #MeToo campaign. “There are some laws that you have to change, anti-harassment, anti-domestic violence, these are the things we have to go through,” she said. The deputy premier said the government will also look into policies to help women in workplaces, especially mothers, by improving childcare facilities. Despite Wan Azizah’s pledges, activists said the new government has failed to fulfill a campaign promise to ensure at least 30 per cent of ministers appointed to national and state governments are women. “It’s not a quota. We have to fill the positions with people who are able to deliver,” Wan Azizah’s said, adding that the government is still committed to meeting the target. Of the 14-member federal cabinet, three are women including Wan Azizah. Campaigners said women are also being sidelined from positions in states like Johor, where only one of 11 state cabinet ministers is female. The Inter-Parliamentary Union ranks Malaysia 155 out of 188 nations in terms of women’s representation in national legislatures, below less developed Southeast Asian nations such as East Timor, Vietnam and Laos. Anwar, who is now free after receiving a pardon following the election, is expected to return to politics. Wan Azizah rejected theories she is a seat warmer for her husband. She pledged to continue her work to break cultural barriers and improve gender equality. This article was first published by Dawn on the 29th of May 2018. It was written by Beh Lih Yi.